Do you set personal reading goals for yourself each year? Do you participate in any yearly reading challenges? I love Goodreads! 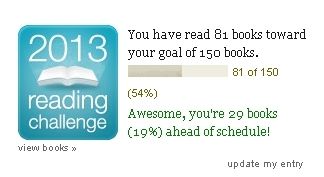 I set a reading goal, but I must admit I purposefully set it low–because I only put the majority of my first reads in Goodreads, and none of my re-reads. I love it, too! I just joined at the end of 2012. I wish I’d known about it sooner! I don’t usually do re-reads until quite a bit of time has passed, so that hasn’t been a problem for me yet.